Sometimes, the novel you start whilst trying to finish another turns out to be The One. The One that keeps you reading all weekend, right up until Sunday night. The One that makes you tear through your chores (even the shopping related ones) and lose all interest in the week's worth of TV you've recorded on IQ. Just so you can kick back on the sofa with your Kindle and return to a world vividly painted by words alone. As I look back on the book reviews I've done on this blog, I realize that quite a few of them are about works of fiction relating to World War II that have been written by contemporary authors. I think the artistic freedom of fiction writing enables the messages of the past to be delivered in fresh and engaging ways to new audiences. It is the perfect vehicle to make sure that as a civilization, we truly never forget the horrors of past world wars. 'Sarah's Key' is set in the present day Paris (early 2000s) with an alternate time frame of the Paris in the midst of World War II. The novel begins in the world of 10 year old Sarah Starzynski, a French born Jew of Polish descent. It is 1942 and Sarah's comfortable suburban life with her parents and 4 year old brother. Michel is rapidly disintegrating in the face of the increasing government dictated persecution and segregation against French Jews. In a country already suffering the restrictions and fear of war, the added factor of what to 'do' about 'the Jews' divides communities as citizens do what they have to in order to survive. This often means turning a blind eye or enabling some horrendous brutality against fellow human beings - in addition to fighting for essential supplies. Eventually, Sarah's family runs out of luck. They find themselves on a list of Jews who are rounded up by the police for some unclear purpose. Sarah assumes it is a day trip of sorts and by a twist of luck, manages to hide her brother Michel from the police by locking him in their secret place in a wardrobe. She takes the key with her and somehow, under the watchful eye of the police, conveys what she has done to her relieved mother. What unfolds for Sarah is a series of Holocaust related atrocities that until recently, many French citizens may have known little about. Sarah and her mother two of tens of thousands herded into inhumane conditions as part of the Vel' d'Hiv Roundup , cruelly code named 'Operation Spring Breeze'. The objective was simple, to sort out the 'Jewish Problem' in German occupied France. Men and women were to be rounded up in mass arrests, detained in holding areas and then transferred to various work and death camps across Europe. To fill quotas as quickly as possible, children somehow got caught up in the arrests. The main area where these innocent people were coralled was a velodrome which was ill equipped to house thousand of men, women and children in sanitary, let alone comfortable conditions. De Rosany paints such a vivid and graphic account of the abuse and deprivation that the young Sarah sees and suffers. It is testament to how shocking the events were that a narrative like this could be built from witness accounts because limited formal research into the period is available. Within days, Sarah herself realizes that she has grown old and perhaps cruel as she does what she can to survive. She knows that there will be no escape and that her parents have died. It is only the hope that Michel is somehow still alive and well in the wardrobe at home that keeps her going and eventually prompts her escape from the Drancy internment camp. 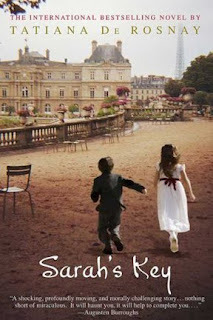 The parallel plot that runs initially in alternating chapters with Sarah's story is that of Julia Jarmond, an American born journalist living in Paris with her suave French husband and their 11 year old daughter Zoe (who was born after a traumatic history of failed pregnancies). Julia is a journalist for a French publication aimed at American expatriates and she is given the assignment of covering the 60th anniversary year of Vel' d'Hiv. In 1995, President Chirac had formally apologized for the crimes committed against over 42 000 French Jews who were sent to Auschwitz. Only 800 returned at the end of the war. Julia's challenge is to find people willing to talk about this shameful period of the past and to get a more human angle to the story. Vel' d'Hiv is now a housing estate and most of its young population have no idea of the area's dark past. Julia happens to find out about Sarah and the fact that Sarah's old address is that of an apartment owned by her in laws. The search for what happened to Sarah and her brother then takes on a more personal note and Julia begins asking questions of her in laws that many appear reluctant to answer. Sarah's probing unearths a secret that the family had kept for decades, since the end of the war. There were many reasons that this book grabbed and then held me until the end. Firstly, it is the first novel about World War II that I've read that deals specifically with the Vel' d'Hiv. Secondly, there were the issues explored through Julia about life as an American expatriate in Paris. It becomes obvious as the novel progresses that loving Bertrand, Julia's husband, is by no means an easy task despite his physical charm. Their relationship reaches breaking point when Julia's longed for second successful pregnancy is announced - at the worst possible time for Bertrand as he struggles with growing old and the fears of what a caring for a new baby would do to his relaxed and privileged lifestyle. After Sarah discovers the fate of her brother, the structure of the novel changes and we lose Sarah's first person narrative and the rest of the novel is told through Julia in a series of entries dated months apart. I found this unsettling and disappointing. However, the reason for this technique becomes apparent when Julia finally discovers what finally happened to Sarah after her escape from the camp and how the effects of that period of brutality shaped and scarred Sarah's adulthood. Fortunately, my fascination with 'Sarah's Key' doesn't have to end now that I've finished reading the book. Kristin Scott Thomas starred in a 2010 film adaptation of the novel. I'm going to look for it at my local Video Ezy this weekend. I'm looking forward to reading the book as I really enjoyed the movie and your review has made it even more enticing. On viewing the movie I realised that I had absolutely no knowledge of the Vel' d'Hiv Roundup and it made me wonder what other atrocities there were that I had missed in my high school history lessons. It's wonderful to find a book that keeps you totally entranced for an entire weekend, you might like to link this post to my 'Vive Le Livre' hop on the first Tuesday of April, I'm sure you'll inspire many others to pick up this treasure. I read the book not long ago, and like you I had trouble putting it down. It is such a sad story but at the same time fascinating and also shocking - to think that the Vel d'Hiv actually happened! Plan to watch the movie as soon as I get my hands on it! I read Sarah's Key over summer and my Mum has just finished reading it too. It is a fantastic book, such an amazing story. Like you some of the best books I've read recently have been set in that time period but from unusual perspectives like Sarah's Key or the Book Thief. I didn't know there was a movie, I will have to seek it out! I've heard about this book!! Must add it to my list, I really do love the sound of it. I've refrained from seeing the movie as I know I want to read this!